It has been almost a year now since I hung up my gear and moved on from the intricacies of the Zelda theorizing community. Yet with all of the details released about Skyward Sword over the last few days, I can’t help but let my roots take over and let the theorist part of me go wild. And it has. While we really don’t know terribly much about Skyward Sword, we know enough to speculate with regards to the timeline and about how this new game fits into the series. Keep reading for my thoughts of some possible connections to the Oocca, the interlopers, The Hero’s Spirit and more. First off, let’s get what we know out of the way. 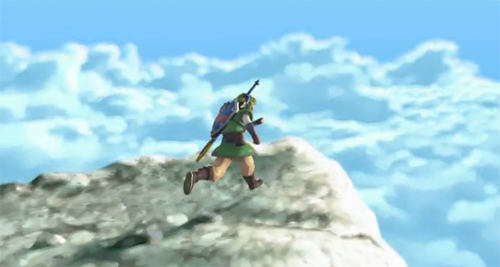 The Link from Skyward Sword lives in a place above the clouds known as Skyloft. Due to some turn of events, he ends up with the semi-humanoid Skyward Sword which allows him to travel to the land below, Hyrule. Hyrule is being ruled by evil forces. As Link progresses he travels between Hyrule and Skyloft and comes to discover why the two places are separated by the clouds. Eventually the Skyward Sword becomes the Master Sword and… well that’s all we know so far. Now for some connections that come to my mind. As Skyward Sword is dealing with the Master Sword origin story, that logically means that on the timeline it is going to predate Ocarina of Time. Now while some fans believe The Minish Cap, and on occasions, even more games come before Ocarina of Time, most fans still hold Ocarina of Time as the series’ first adventure. Skyward Sword however seems to have taken that slot. Interestingly, three years ago Nick Geml of Zelda Informer wrote an article stating that there may be a hero before Ocarina of Time, and that was based on some vague references from Ocarina of Time. Once Link had turned into adult form Rauru says “As I see you standing there holding the mythical Master Sword, you really do look like the legendary Hero of Time.” While most take that to mean that Link lives up to the expected looks of the hero, others have taken the quote to mean that Link looks like the hero of the past who also held the Master Sword. Skyward Sword may contain that hero. Twilight Princess is riddled with references to an ancient hero. There’s Link’s deeds bringing the memory of the ancient hero’s kindness to Renaldo’s mind and the references when Link receives the Hero’s Bow from the Goron’s and the Hero’s Tunic from Faron. Up until now, it was generally agreed that this must be a reference to the Hero of Time, but considering that Skyward Sword likely predates Ocarina of Time, Twilight Princess may have been referring to an earlier hero. The title ‘ancient hero’ may be more fitting of someone before Ocarina of Time, as opposed to the Hero of Time himself. Generally, whoever fans considered the ‘ancient hero’ to be in Twilight Princess was also who they considered the Hero’s Spirit to be. In light of Skyward Sword, perhaps the Hero’s Spirit is this new hero. While the Hero’s Spirit does bear a striking resemblance to the Hero of Time, as I’ve written before, he doesn’t necessarily have to be. 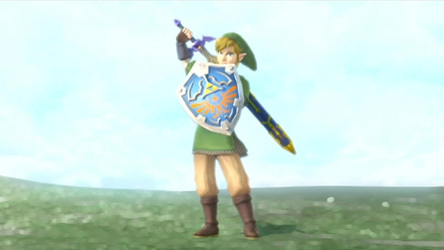 There is the argument of whether the Hero’s Spirit being left-handed (GCN) or right handed (Wii) reveals who he is, knowing that the Skyward Sword Link will be right-handed. Nevertheless, there is one strong correlation here. The Hero’s Spirit teaches the hidden skills, and howls the wolf songs with Link in a realm in the clouds above Hyrule. Perhaps it has some connection to Skyloft. When it comes to living above the clouds in Zelda there’s also The Wind Tribe from The Minish Cap, who live on the clouds. That alone is cause to suspect potential correlation, but I see more connections to be drawn to the Oocca and their home in The City in the Sky. The sages are the ones credited with the creation of The Temple of Time and sealing the Sacred Realm with the Master sword. However in Twilight Princess Rusl lets us know that the Oocca also helped. “The ancestors of the Hylians created the temple… Signs of their civilization—ancient, but very sophisticated—-are everywhere.” When you compare The City in the Sky and The Temple of Time, their construct is very similar. So the Oocca, a race from the sky, helped the sages build the temple. With Skyward Sword we have Link bringing a sword from the sky that eventually becomes the Master Sword. Is this Link somehow correlated to the Oocca? Is the Master sword a gift from the Oocca to the sages? There is potential. Shad has some interesting information about the Oocca: “Yes, according to legend, Hyrule was made by the Hylians, who, as we all know, are the closest race to the gods. But also according to legend, long ago there was a race even closer to the gods, and some say THESE creatures made the Hylians. When they created the people of Hylia, they simultaneously created a new capital, a city that floated in the heavens.” Could this quote here somehow pertain to the explaining Skyward Sword is going to do on why there is a land above the clouds and why it is separated from Hyrule? Maybe it will. While we’re still on the Oocca and Twilight Princess there is one point that I want to highlight. In Skyward Sword Link travels between Skyloft, “the heavens”, and Hyrule, “the land below”. Twilight Princess mentions someone who did the same; namely, The Messenger to the Heavens that Impaz tells us of. “Among the legends of my clan, there is a story from the time when the Oocca still maintained contact with the royal family. Yes, it said that a mysterious rod was handed down from the people of the sky, and it was called the Dominion Rod…The rod was only to be carried by the messenger to the heavens when the royal family needed to communicate with the Oocca.” Naturally, I always assumed that the messenger came from Hyrule and carried messages to the heavens, but given Skyward Sword I’m willing to accept that perhaps Link from Skyloft may be the messenger. Or if he’s not the messenger, there may still be some connection between the messenger and Skyloft. The last thing that Skyward Sword has got me speculating about is what exactly the ‘evil forces’ ruling Hyrule are. While people’s opinions will differ depending on their timelines, it is hard to pin-point what exactly the conflict of Skyward Sword will be. Considering it is a Master sword origin story, could it be about the conflict involving the interlopers where the sages had to seal away the Triforce for safekeeping? Could there have been some evil force working in Hyrule before the Civil War that unified the land under the king? Or could Ganondorf somehow have been causing havoc before Ocarina of Time, which is the game most people consider to be his rise to power. No doubt, Skyward Sword has a lot of questions to answer. No doubt that when it finally arrives it will raise more questions and provide some answers, but will it provide these answers? While there is the potential for numerous strong connections to elsewhere in the timeline and evidence for theories, do we really expect Nintendo to limit themselves to making connections to what exists? It should not come as a surprise if Nintendo goes their own direction and does what they want, without thinking of these intricacies. Maybe once the game is released some of these ideas will be strengthened as theories, but by no means confirmed. It is interesting food for thought, but only time will tell what speculation is correct. Considering how well theorists were able to identify the Master Sword from the Zelda Wii artwork released a year ago, I would listen to what they have to say about all that we now know about Skyward Sword.